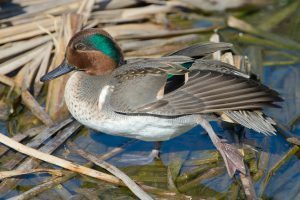 The Maryland Department of Natural Resources announced the state’s teal hunting season will open Sept. 16 and continue through Sept. 30. Shooting hours are a half-hour before sunrise to sunset. The daily bag limit is six (blue or green-winged teal). The possession limit is three times the daily bag limit (18). “We are pleased to offer Maryland waterfowlers the opportunity to pursue and hunt these two early migratory birds,” Wildlife and Heritage Service Director Paul Peditto said. September teal seasons are offered to states that derive more than 80 percent of their annual teal harvest from the Prairie Pothole Region of the north central U.S. and southern Canada. The U.S. Fish and Wildlife Service’s annual Breeding Waterfowl and Habitat Survey recorded about 8 million blue-winged teal and 3.5 million green-winged teal in 2017. All migratory game bird hunters, including landowners who are license-exempt, must possess a Maryland Migratory Game Bird Stamp/Harvest Information Program Permit. Hunters 16 and older are also required to possess the Federal Migratory Bird Hunting and Conservation Stamp (federal duck stamp), which must be signed in ink across the face to be valid. Hunters buying the federal stamp online may use the purchase code or printed receipt to show proof of purchase for 45 days. Hunters will receive their stamp within that time frame. Maryland licenses, stamps and permits may be purchased online, by phone at 855-855-3906, at a service center or at the more than 250 Sport License Agents statewide.